We have many varieties of tropical hibiscus plants in our flower garden. This showy blossom is called Morning Glory. The color on the petals is shaded from deep rose in the throat, to pale rose, bordered by creamy white at the margins. The petals have a slightly crinkled look, with ruffled edges. The blossoms are large -- often 5 to 6 inches (12 to 15 cm) in diameter. The Morning Glory, is one of the innumerable cultivars of Hibiscus rosa-sinensis. It is a hardy plant in our climate, and each plant yields a prodigious number of blossoms almost constantly. Here are some more tropical hibiscus varieties from our garden: Candy Wind / Ecstasy / Hawaii Belle / Hula Girl / Hurricane Lily / Ivory / Painted Lady / Princess Michiko / Starry Wind / Sundance. Bobbie, this is a gorgeous flower. It looks like crepe paper, and the color-perfect! 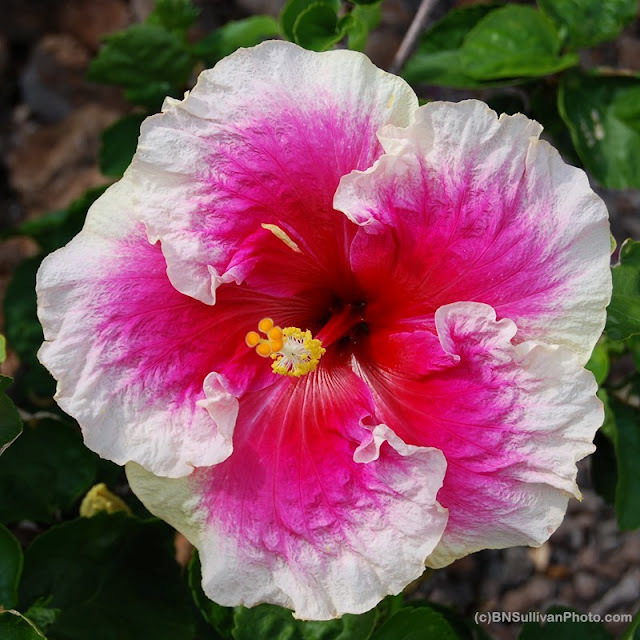 Hi Becky - This is one of my favorite hibiscus varieties. It does look a bit lie crepe paper, now that you mention it! Wow. What a beautiful mix of colors. I love the ruffly edges of the petals.